My Mom would say that my Great Grandma used to say “There’s always room for Jello.” I don’t know if that was some old campaign Jello used or if that was my Great Grandmother making up a saying for her Jello cravings. 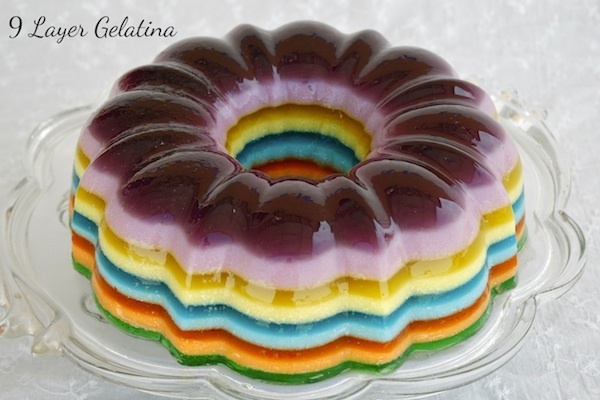 As a Latina, it is part of my genetic make-up to not only want to make a jello mold, but to make it look festive and colorful too. I am lucky to have been surrounded by some beautiful jello molds growing up that all the Mexican markets would sell in my neighborhood where they are commonly known as “gelatinas.” This is my spring gelatina, it reminds me of my Tia Rosie’s dress or a beautiful crocheted blanket I bought in Mexicali. I use a sweetened condensed milk for the creamy layers and wow does it make a difference. Enjoy! Divide up 4 of the jello mixes, by cutting open each bag and scooping out 1/3 of a cup of jello mix from each color and placing them each in their own bowl. Set the rest of the jello powder to the side. Then in each bowl that already has 1/3 cup of jello powder add in 1 1/2 teaspoons of Knox gelatin. Set to the side. You should have a total of 4 bowls at this point. Add 1 – cup of hot boiling water to each bowl and mix until gelatin is completely dissolved. Then add in 1/3 cup of La Lechera to each bowl and mix well. Set to the side. With the remaining jello powder from the 4 packets you opened, add each color to it own bowl it should measure out to a little over 2/3 cup, then add 1/2 teaspoon knox gelatin to each of the jello powders. Mix well to combine. Then add 1- cup boiling hot water to each bowl and mix well until jello is completely dissolved. Set to the side. With the last box of jello add the entire content to a bowl then add in 1 – cup boiling hot water and mix well. Set to the side. Spray your bundt pan with non-stick cooking spray, make sure to spray it well and get every nook and cranny of the pan. Now for the fun part…. choose the order of color you want your jello mold to stack in. Then pour your first color in and quickly place in the fridge for 35 minutes. While the first layer is chilling/firming up this gives the other colors plenty of time to come to room temperature. Remove the gelatina from the fridge. You will know if the first layer is done by pressing on the top…. if your finger print is left in the top then you are safe to add the next layer. Gently pour in the next layer and place back in the fridge for 25 minutes. Remove from fridge and add the next layer, place back in the fridge for 25 minutes. There is a 25 minute wait time between layers if the jello mixtures have come to room temperature. Continue to do this till all layers are in the pan, then let it set overnight. The un-molding of the pan can get a little tricky so read carefully. First with both hands gently pull jello away from the wall of your bundt pan. Work your way all the way around little by little. Don’t forget the center. Then in a big bowl fill it up with warm/hot water and slowly glide the bundt pan into the water bath and let it rest there for 10 to 15 seconds. You will see the insides of the bundt pan become slightly moist… this is the sign you are looking for. Remove pan from water and dry it off with a towel. Then place a plate on top of the pan and flip it over onto the plate. You will hear a plop…. gently remove the pan and you will have a beautiful and delicious gelatina. Place it back in the fridge for 30 minutes to allow it to firm up again. This 9 layer gelatina is simply stunning. It reminds me of a rainbow and so make me smile wide. Thanks a lot for sharing the recipe! My children will be thrilled to help me make it and especially, to devour it. This is the greatest dessert I’ve maden in years!!! How many days in advance can I make this ? Is two days ok?? I made this today but am having trouble. I did everything correctly but found that the bowls of jello that were left going to room temp – gelled up while I was waiting 25 minutes per layer. Maybe I have done something wrong. Are you supposed to pour 1 layer on and then pour the water into the next one while waiting for it to gel? All my bowls have come to room temperature at once?? Wow… that is strange. When I made this recipe…. it was very hot that day, so my jello never gelled until in the fridge. I would definitely make them one at a time moving forward if you live somewhere a little cooler. Sorry about that. Can I take the jello out of the mold, and then refrigerate it overnight, or should I put it on the serving plate 30 min before serving and re-refrigerate it for a short time? 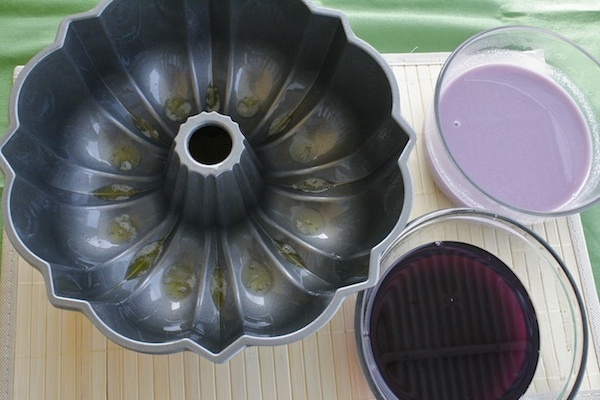 You can totally remove the jello from the mold and place it in refrigerator overnight. I was wondering I wanted to put food like olives and small finger foods inside the layers one layer at a time to make it look like its floating. So how long do I wait to put in the food before it fully sets?